There is plenty to celebrate for this year's Open Access Week October 24 - 31 everywhere! 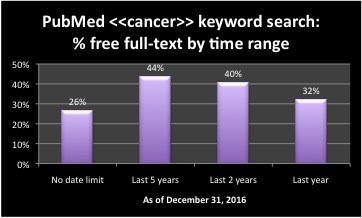 As of Oct. 6, 2016, a Bielefeld Academic Search Engine (BASE) search includes over 100 million documents! 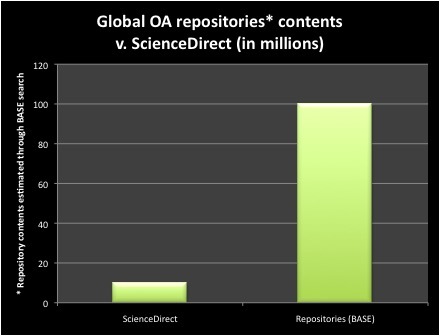 Globally the collections of open access archives are now collectively an order of magnitude larger than the 10 million articles and books claimed by Elsevier for Science Direct. Congratulations to BASE and everyone in the repositories movement that is making this happen! 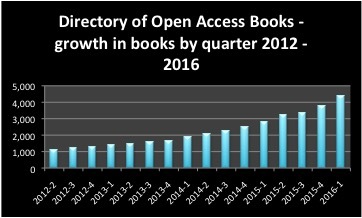 In spite of a vigorous weeding process, new get-tough inclusion policy and negative growth in the past year in journal numbers, the Directory of Open Access Journals showed an amazing 11% growth in the past year in articles searchable at the article level - about half a million more articles today than a year ago. 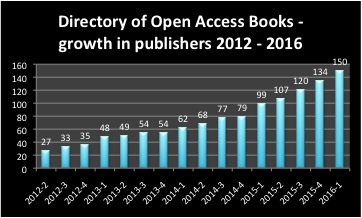 This past quarter DOAJ showed a healthy growth rate of 135 titles or added 1.5 titles per day. 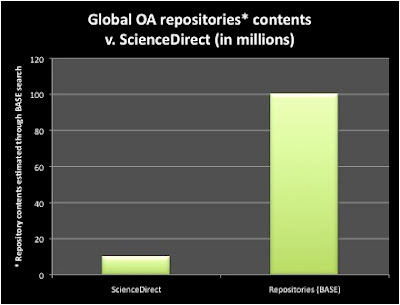 For every journal added by DOAJ in the past quarter, another repository was added to the vetted OpenDOAR collection of repositories. The Internet Archive now has more than 3 million audio recordings. 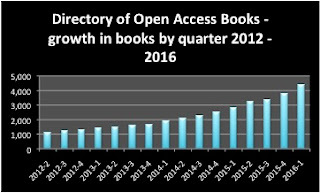 The Directory of Open Access Books added over 2 thousand titles in the past year for a current total of over 5,000 titles (60% annual growth rate) from 161 publishers (41% annual growth rate in publishers). 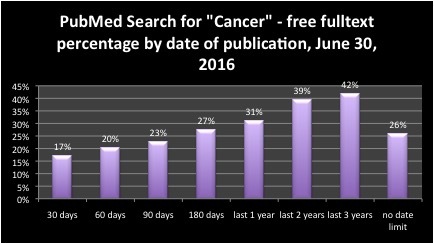 The number of journals actively contributing to PubMedCentral continues to show strong growth in every measure: there are 212 more journal active participants in PMC today than a year ago, a 10% growth rate; 170 more journals provide immediate free access, an 11% growth rate; 113 more journals provide all articles as open access, a 9% growth rate; and the number of journals with some articles open access increased by 123, a 31% growth rate. Full data is available for download from here.